Lesson 1 "Getting Started with QuickBooks" covers how to: use QuickBooks is easy when using the sample data installed with your software, create your first QuickBooks file in minutes by using the QuickBooks Express Start, convert easily to QuickBooks from other software, work with multiple users, set up security in QuickBooks Enterprise, and report on user activity in QuickBooks. Lesson 2 "Navigate QuickBooks" covers how to: navigate and customize QuickBooks, set up preference, access help options in QuickBooks, and select a company file to open. Lesson 4 "QuickBooks Lists" covers how to create and manage the Chart of Accounts in QuickBooks; set up QuickBooks Items, use QuickBooks Class Tracking, use Customer Types, manage lists, list reporting; and find and fix errors. Lesson 6 "Manage Inventory" covers adjusting inventory, record both quantity and value adjustments, manage your Inventory reports in QuickBooks using the Inventory Center and Report center, and properly report on the financial impact of inventory transactions. Lesson 7 "Set Up Vendors" covers how to customize the QuickBooks home page and set important vendor preferences; work efficiently with vendor activities in the QuickBooks Vendor Center; add, modifying, reporting on vendor transactions is easy from the Vendor Center; accurately record vendor purchases in QuickBooks; and control business costs by using the proper accounts payable process in QuickBooks. Lesson 8 "Manage Vendors" covers how to accurately report on vendor activities in QuickBooks, learn which reports provide timely information about vendor transactions, and track and report on vendor 1099 earnings in QuickBooks. Lesson 10 "Manage Customers" covers how to keep your QuickBooks customer records in order by reviewing important reports, manage overdue customer balances with the Collection Center, verify the QuickBooks sales tax setup, reconcile the company financials to the sales tax reports, properly adjust the reported QuickBooks Sales Tax, and properly pay the sales tax due. Lesson 11 " Set Up Payroll and Employees" covers how to set payroll specific preferences, use the Payroll Setup Interview to quickly get started with payroll in QuickBooks, add or edit employees in QuickBooks; find payroll transactions is easy using the Employee Center, create the needed payroll items in QuickBooks, pay employees, and prepare payroll liability payments. Lesson 12 "Payroll Reporting" covers payroll reporting in QuickBooks made easy with the Report Center and readymade Excel reports; tax forms and filings, and how to use the Run Payroll Checkup to validate that your payroll data is setup properly. Lesson 13 "Bank and Credit Card Transactions" covers how to create Write Check transactions to record business expenses in QuickBooks, use the Write Check to record bank debits, review your bank account register, create credit card transactions, transfer funds between bank accounts, use online banking with QuickBooks, and reconcile bank or credit card accounts. Lesson 14 "QuickBooks Reports" cover how to use the QuickBooks Company Snapshot for dashboard reporting, use the Report Center, set specific report preferences in QuickBooks, modify reports, customize reports, automate displaying and printing reports in QuickBooks with Report Groups, use and manage Report Groups in QuickBooks, organize memorized reports, export and import report templates, export reports to Excel, and email reports. Lesson 15 "Review Your Data" covers how to review your QuickBooks Balance Sheet report; use the Balance Sheet report to track the company’s assets, liabilities and equity; review the QuickBooks Profit & Loss report; use the Profit & Loss report to track the company’s net income or (loss); and simplify your review of QuickBooks data with these important reports. Lesson 16 "Share QuickBooks Data with Your Accountant" covers the different QuickBooks file types and their uses, how to share data with your accountant; use Accountant’s Copy, and how using the Send Journal Entries or Batch Enter Transactions in QuickBooks can save time for both the accountant and business owner. Lesson 17 "Install QuickBooks" highlights what you need to know before installing your QuickBooks software. This lesson teaches about the Express Install or installing for multi-users, upgrading QuickBooks, installing QuickBooks maintenance releases, protecting your QuickBooks data by making a backup, and monitoring your QuickBooks database. Lesson 18 "Other Planning and Management Tools in QuickBooks" covers how to create a budget, and track your actual revenue and expenses to your budget, print and delete a budget and use QuickBooks Loan Manager. This lesson also covers where to find it and how it can help with year-end tasks; how to synchronize your QuickBooks Contacts with Microsoft Outlook, and use QuickBooks Timer. QuickBooks 2013 LiveLessons provides easy to follow instructions on how to properly setup and use your QuickBooks software. This video training is for every entrepreneur, manager, accountant, and bookkeeper who wants to master QuickBooks fast! Laura Madeira, Advanced Certified QuickBooks ProAdvisor and member of the elite Intuit Trainer/Writer Network. 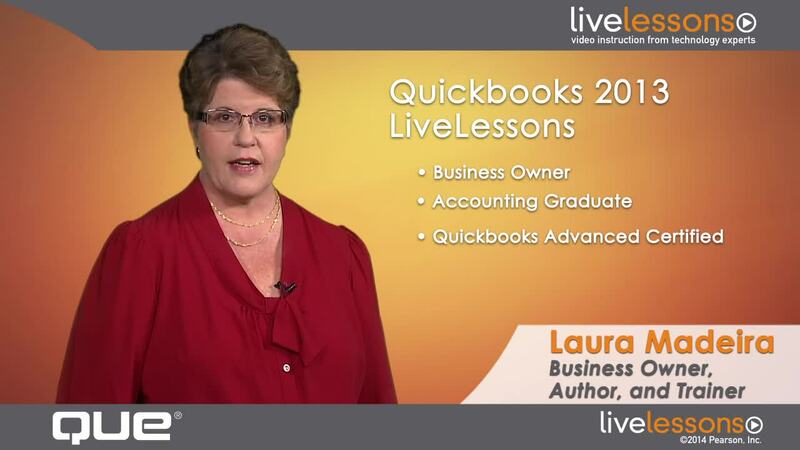 Laura has presented to thousands of users the "What's New for QuickBooks" each fall. Laura is the author of QuickBooks In Depth, QuickBooks Solutions Guide and co-author of QuickBooks on Demand. • Start-to-finish personal training on QuickBooks 2013: just watch and learn!